Can you believe it? A boy project. I’ve been trying to think of new things for my sweet boy…..it’s just harder to come up with projects for him. Skirts and frills that seem to be easy to create…..don’t look so great on boys. Darn. 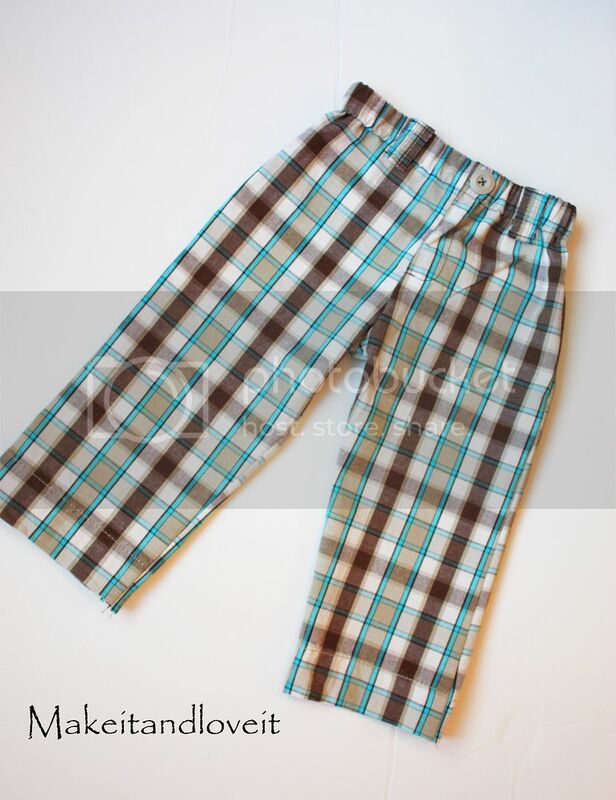 But how about some hip little pants? Complete with belt loops and faux back pockets. All made from a men’s pair of shorts. And then match it up with a shirt and tie. However, you may find yourself wanting to eat him up. Mmmm….cute. Give it a try if you have a little guy. 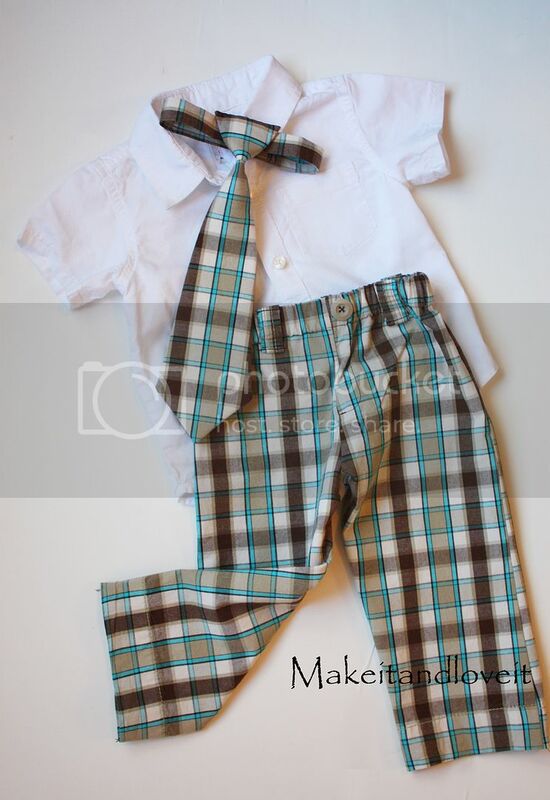 Then, using the tutorial here, make a pair of pants to fit your little guy. Turn under the ends of the loops a 1/4 inch and attach to the pants. Then I cut rectangles from the waist band to create back pockets that were about 3 1/2 x 2 1/2 inches. (My pants are size: 18 months.) By using the waistband, it was already double layered and had a nice seam for the bottom of the flap. But you can use scrap fabric and create your own double layer and bottom seam. No worries. The I folded under each end a 1/4 inch. And that’s it. 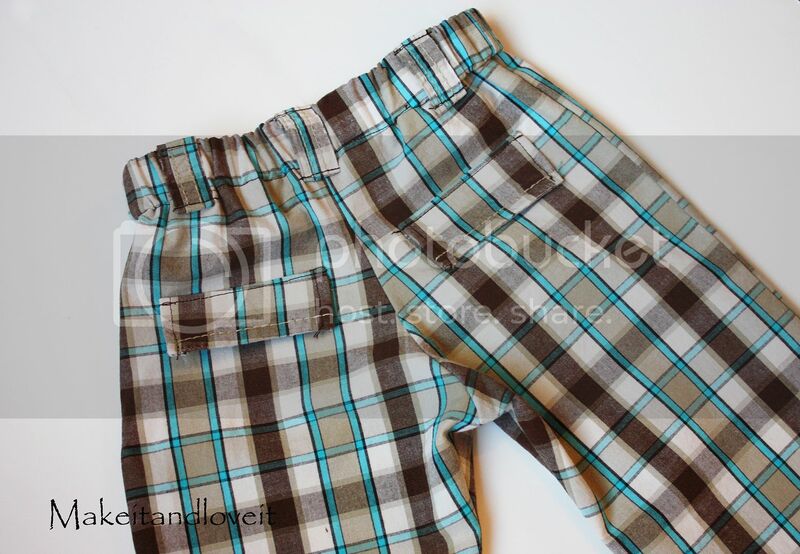 A rockin’ new pair of plaid pants for your little guy. So cute!!!! I finally have a little boy to sew for!!!! Yay! Boy clothes! I have two boys and wanted girls both times so your cute little girl creations make me want a girl even more so thanks for making something that my boys can wear (without having my husband tell me they can't wear it out in public)! can't wait for the tie pattern! I know your busy but I was wondering if you have the boy tie patterns up for sale yet? I just love your blog. You have inspired me to make afew things and dust off the sewing machine again. I recently repurposed a velvet prom dress I had and made my daughter a skirt for Christmas. All the embelishments made perfect bows. She is ready for Christmas now. At no cost to me. Ya! Love it! Thanks for posting something cute for the boys! love these. I can't wait to make them!!! These are adorable! I'm so glad that you show some things for boys because there isn't much out there! Thanks! A boy project! As the only female in my household – Thank You! I love the matching tie! ack! that tie is so flippin adorable! Can't wait for that pattern. 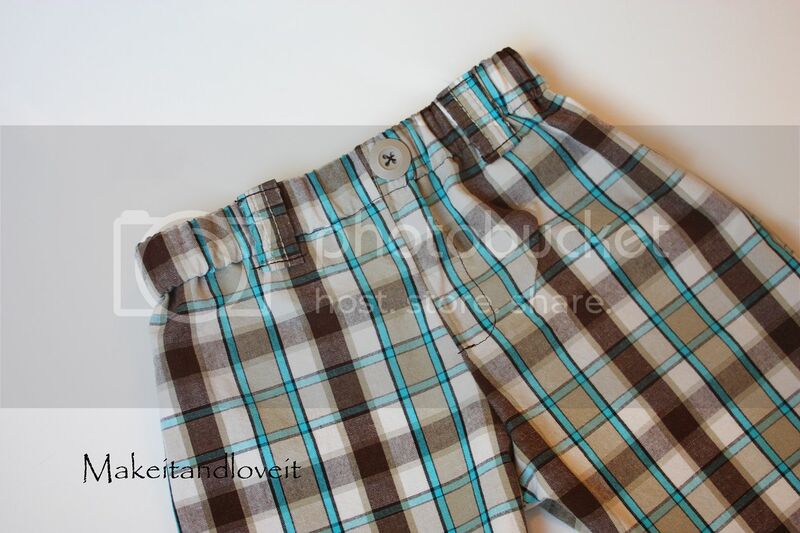 Love these, I am going to have to convince my husband to get rid of some of his shorts. I think it is just great that both your little girl and your little boy are the same sizes as my little ones! It makes things soo easy! Thanks for the tutorial. Can't wait for the tie pattern! Yeah! With two little boys, I love seeing boy things! What a great project…. you are brilliant! i will be copying this for my littlest boy. thanks! i don't have a baby boy but i have a baby girl who goes through clothes way too quickly! thanks for the great post! i'm a new follower of your blog! love it! Thanks for sharing all your creative ideas! OMG! I was looking for white pants to purchase for my little one. And funny enough… I sew. I should just make him some pants. Thank you so much for your post. It reminded me of what we crafty people do best… and that is to use our hands. Note that I will probably not repurpose them, but you have inspired me not to only to make them, but also to just keep in mind that if you make them, you can make matching things to go along with them. (Since I need white pants for him, I will have to find fabric, but truly … you just gave me an 'ahh haaa moment'.